You can be proud to send this elegant masterpiece and they will be thrilled to receive it. 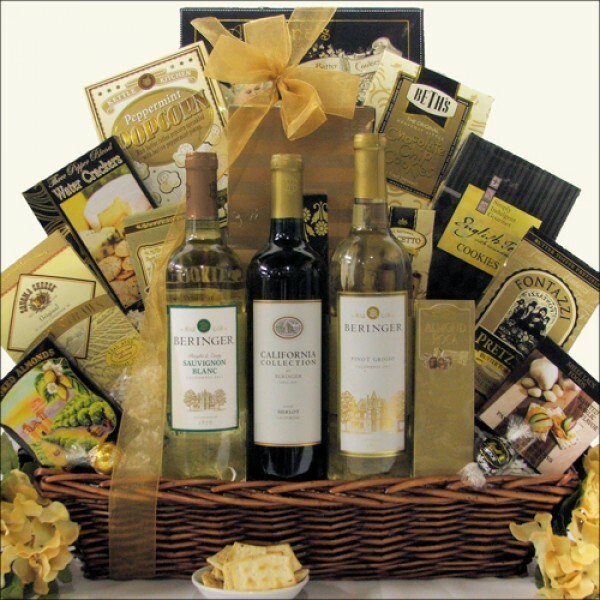 The Beringer California Collection Trio Gift Basket contains three of the country's best-selling wines and a large assortment of delicious snacks and treats. In addition to the Pinot Grigio, Sauvignon Blanc and the Merlot we have included Garlic Flavored Cheese Spread, Three Pepper Blend Water Crackers, Chocolate, Cookies and Candy. The perfect gift when you want to make a nice impression. ...in a Rectangular Brown Stained Gift Basket with Side Handles.